MINISTER FOR JUSTICE Alan Shatter has been called on to resign over the ongoing row about allegations concerning Deputy Mick Wallace and penalty points. On Thursday night, the Minister alleged on RTÉ’s Prime Time that Wallace had been cautioned for driving while using a mobile phone, but benefited from garda discretion and avoided penalty points. Wallace said that he had no idea what Shatter was referring to, which was rubbished by Shatter in a statement. Wallace later said he would lodge a complaint against the minister. However, in a statement yesterday, Shatter said that Wallace was “making a pretence, for political purposes” in saying he did not know what incident the minister was referring to. In a statement today, Wallace described Shatter’s statement as being “a further attempt to deflect attention from the grave issues of Garda malpractice”. He accused Shatter’s statement of deliberately misrepresenting his position and said that he is unaware of the incident. Wallace intends to continue to pursue this issue and will be calling a press conference along with his colleagues Clare Daly TD, Joan Collins TD and Luke Ming Flanagan TD next week. Fianna Fáil TD Niall Collins told TheJournal.ie that in an interview with RTÉ earlier this evening he called on Minister Shatter to resign. How can the Taoiseach and the Tánaiste expect people to have confidence in the Minister when he has clearly crossed the line and he has blatantly abused his position to clinically smear another individual with privileged information? Collins said that questions have arisen as to how Shatter is in possession of the information, and why he decided to use it in this manner. Collins’ party are also asking has Shatter used similar information against other people “that we are not aware of and we are calling into question his judgement and we are calling on him to resign”, continued Collins. When asked by TheJournal.ie what reaction he anticipates from this call, Collins said “you would expect the Taoiseach and Tánaiste to… be very concerned and take an interest in it”. How do they expect people to have confidence in the Minister for Justice and by extension the Government when a government minister is abusing his position? Sinn Féin’s justice spokesperson, Pádraig Mac Lochlainn TD, said that Minister Shatter must explain how he came by the alleged information about Wallace. Deputy MacLochlainn described it as “very worrying” that a Minister for Justice can go on Prime Time “and use information which he says comes from An Garda Síochána, to score a political point against a Dáil colleague”. The Minister must explain how he came by this information and clarify that it is not hearsay. 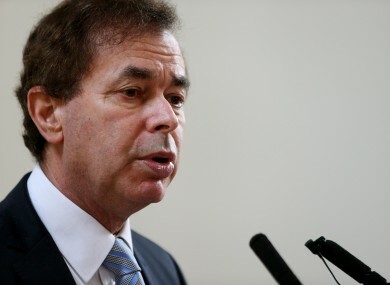 Email “Shatter called on to resign over Wallace penalty points row”. Feedback on “Shatter called on to resign over Wallace penalty points row”.